In front of more than 160 Japanese, the Special Economic Zone Authority in Duqm (SEZAD) has presented a various investment opportunity in the zone, which reach 2000 square kilometers and includes diverse investment areas in the industrial, commercial, tourism and real estate development sectors. This came during a promotional campaign organized in Japan by the Economic Zone Authority in Duqm in cooperation with the Embassy of the Sultanate in Tokyo and included the cities of Tokyo and Osaka. He added, “We support the economic cooperation between the two countries and we encourage Japanese companies to invest in the Sultanate. He also stressed the importance of the strategic location of Duqm, which is located away from the Straits of Hormuz and near the consumer markets in Asia, Africa and the GCC countries. He also indicated the advantages of investment and the economic importance of the SEZD and its ability to keep up with the expectations of Japanese investors, pointing out that Duqm is located near Japan’s major markets in Asia and Africa and Japanese companies can set up factories in the SEZD. He called on Japanese businesspersons to invest in the Sultanate. He said that this seminar is a real opportunity to explore the advantages of investing in the economic zone in Duqm. He expressed his hope that the campaign will result in investment partnerships benefiting from the growing trade, economic and political relations between the two countries. Bringing together the Sultanate and Japan. "The future is promising and investors, whether domestic or foreign, will benefit greatly from investment incentives. The State Minister of Economy, Trade and Industry of Japan HE. Yoji Muto his pleasure to hold an investment seminar in Tokyo, stressing the close relations between the Sultanate and Japan. He said that Japan hopes to deepen relations between the two countries, stressing that the Sultanate is a very important country for Japan in all fields. He also called on the Omani side to take advantage of the Japanese technological progress in the plans of economic diversification. In his speech, he noted the celebration of the Sultanate and Japan during this year of more than 40 years of diplomatic relations between the two countries, and the visit of the Japanese Prime Minister Shinzo Abe to the Sultanate in January 2014 and the visit from his meeting with His Majesty Sultan Qaboos bin Said and the memorandum of understanding dialogue and political consultations between the Ministries of Foreign Affairs of the two countries. He expressed his wishes for the success of the promotional campaign and its objectives in attracting the Japanese private sector to invest in Duqm. The SEZAD and the participants presented a number of visual presentations and focused on the investment environment in the Sultanate in general and the economic zone and the incentives provided by the investors and facilities provided. Saleh Bin Hamoud Al Hassani, Director General of Investor Services in SEZAD said “the zone enjoying by many advantages to being the largest private economic zone in the Middle East with a total area of ​​2000 sq km, indicating the tax and non-tax benefits and incentives offered by SEZAD to investors. He explained that the (One Stop Shop) in SEZAD provides many services to investors, referring to the efforts of the Authority in simplifying the procedures and provide many incentives. He said that the Duqm refinery, which is implemented by Omani Kuwaiti partnership it will be an economic engine for the zone, referring to the stages of the refinery project. In Osaka, the SEZAD reviewed the advantages of investment and its incentives. Mr. Reggy Vermeulen; the CEO of Port of Duqm Company SAOC said that the region has all the essential credentials and important ingredients for investment either for its strategic geographical features as it overlooks the Indian Ocean or for the facilities and incentives it offers to its potential investors. 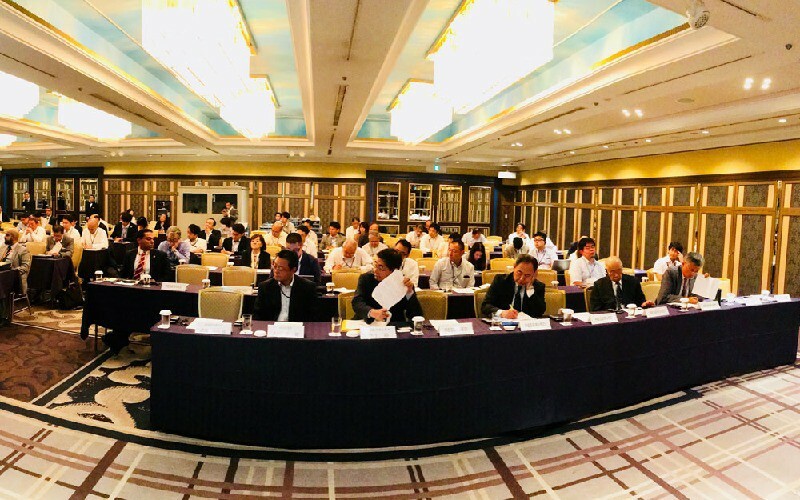 In the symposium that was held in Osaka of Japan, Mr. Vermeulen added that SEZAD offers its investors many encouraging investment opportunities commending and referring in this regard to the components and features of this zone and its currently in progress projects. He has indicated that the Port of Duqm has an ideal geographical location on the world's shipping lines the matter that makes it easy and convenient for these lines to utilize the port as a major hub linking between the east and the west. In his visual presentation displayed during the symposium, Mr. Vermeulen has encouraged the Japanese companies to use the Port of Duqm in its business operations stressing at the same time the fact that the shipping lines that utilize the Port of Duqm will gain savings in terms time due to the unique location of the port in an open sea. In a visual presentation by Amna Al Sharji from Urban Planning Department in (SEZAD), she has addressed and touched on the facilities and incentives granted by SEZAD to the investors and projects currently in progress in this zone and the investments and projects solicited thereby over the last years such as the Chinese Omani Industrial Park. Duqm Refinery Project set up by means of mutual investments from the Sultanate of Oman, State of Kuwait and State of Qatar as well as many other valuable projects.